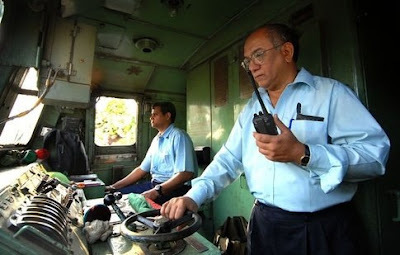 Members of the All India Loco Running Staff Association and All India Guards Council are observing a 36-hour-long hunger strike at the South Central Railway Divisional Railway Manager (DRM) office here on Tuesday, demanding that the Indian Railways meet their demands. Centre of Indian Trade Unions State vice-president V. Umamaheswara Rao inaugurated the fast. The loco pilots and guards are protesting a demanding reduction in working hours, implementation of the recommendations of the High Power Committee, providing safety for the passengers and other demands. Railway Contract Workers and Employees Union general secretary S.M. Subhani, employees B.S. Rao, D. Balaswamy, R. Vasanth Kumar, S.R.D. Rao, K. Nagaraju, B.V. Rao and others sat on the fast on Tuesday. ट्रेनों में बिना टिकट कटाए चढ़ गए थे 115 यात्री! अगर इस ट्रेन से जाते हैं इलाहाबाद तो जरूर पढ़ें ये खबर!